Those of you who have been following along with my Instagram stories voted that you wanted my next post to be a garden tour, so here it is! I don't think I've ever shown the whole thing completely like this, so I'm happy that a garden tour was something you all said you wanted to see. Things are a little bit haphazard, and not completely tidy and manicured, but I wanted to give you a sense of what it looks like in real life on a regular day. There is a lot I still want to do - and a lot more I would do if we weren't merely renting the space, but for now this is what it looks like. The area I have for my garden is all north facing, so I am having to be creative with how I arrange it, and what I grow. I am starting a lot of things inside that my neighbours would normally succeed with by direct seeding. 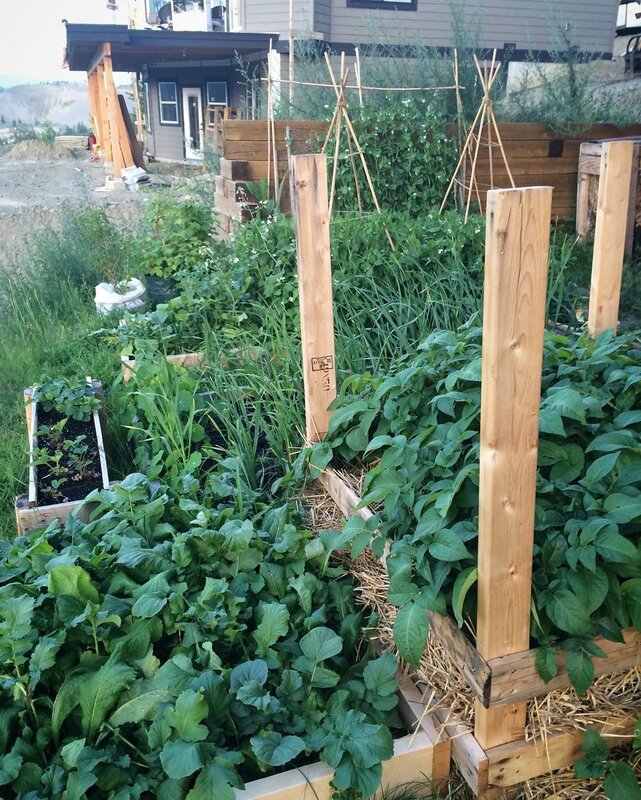 We've been adding on a few raised beds each season, so the layout evolved organically. In the photo above you can see the four newest additions. I think we have room for one more (beside the furthest bin in the left photo below). Since we are tenants, we wanted everything to be affordable, and easy to dismantle in the event that we needed to move out. We chose to make all of our raised beds without bottoms or lining of any kind so we can simply unscrew them, spread out the beautiful soil, and reseed with grass. If you follow me on Instagram you can see the process of how I put them together in my saved stories. We buy 10"x2"x12' boards from the hardware store and each bin is one board. It's not the most elegant solution, but it's very affordable, and keeps things in small, manageable sections. It's also easy to walk across, or stand on their walls if I need to reach something, or don't want to walk all the way around a path. You'll notice that a few of the beds have PVC pipe hoops over them. We were planning on doing some poly tunnels over a few of them to extend the growing season last winter but ran out of time. I'll be using them as trellises for the vining plants this summer, and then we'll do them as low tunnels this coming winter and see what we can overwinter. So far there isn't all that much planted this year. I have some perennials - raspberries, bunching onions, strawberries, haskaps, blueberries, rhubarb, mint, chives, hyssop, lemon balm, and yarrow - and a few other things like brassicas that were just put in the ground very recently. I am excited to see how my haskaps and rhubarb do now that they are well established and in their third or fourth years. Bunching onions are a recent favourite I got last year from a neighbour who was dividing their plant. I haven't had very good success with growing regular onions, so having them in the ground, basically ready to eat all the time has been a revelation! They don't have much of a bulb, so I still buy regular onions, but you can use these any way you would use a spring onion, or a shallot. In the above photo you can see a few of our bins that don't match our other basic square ones. The three small ones near the wall were made for me by a friend from Church who had some spare wood and wanted to make some for me. The really long raised bed is one we did before we realized that it is really hard for me to reach all the way to the back of it - especially now that we have the potato bin and other beds blocking the access from a few directions. I also filled in the space behind the three small bins with dirt for some perennial berry bushes. You can see this better in the photo below. As far as what is growing right now, below are a few snapshots of the perennials (and some overwintered brassicas) coming back to life for the spring. The one I am most excited for is the rhubarb, but I am also watching the progress of the Bianca hops (top left photo) closely as it is my first time growing them, and I think hops bines are really beautiful. As always, I am so grateful for the gorgeous view of the valley I have from my garden. The best mornings are when I have a mug of coffee, and I get to wander around the garden and check on everything. We have quite a few birds and other animals that come to visit, so I enjoy watching them and marking the seasons when they come and go. Right now the warm weather is bringing back the tree swallows, and I love watching their swooping flights. We have deer, and bears (mixed blessings there as they can also be quite the nuisances), and last year a whole bunch of garter snakes were born right in the garden. Little forager enjoyed watching them, and I enjoyed that they helped take care of some of the pests. I love that I have a garden that encourages biodiversity. I'd love to hear about your gardens in the comments below. Or if you don't have a garden talk to me about what you wish you could do if you had a garden! Ok so here is the beginning of a lovely new season of growing in our new location! We are loving Kamloops so far and I am particularly excited because this is an especially good climate for growing tomatoes and melons and things like that. It gets nice and HOT in the summer! Anyway, these are the first few beds we've been working on. One fun story is that since Mr. Forager's new job (the reason we moved) is at the Church down the street, we've been in contact with several awesome people who are full of great advice and also skills. I asked one man if he had scrap wood lying around that I could use to make some raised beds. He said he might and that he would get back to me. Later on I got home one day and found these super convenient boxes made for me! We are using them upside down because they weren't going into the ground very well. It doesn't really make that much of a difference. I suppose we can cut off the stakes if they get in our way, or I can use them to tie plants up to or something. Either way! Anyway, my favourite method for filling up my boxes is to use a combination of lasagna gardening and hugelkultur techniques. I was particularly excited because I got to use up some of my Christmas tree to fill the boxes and that enabled me to use much less soil, and I won't have to dig or till the boxes since all the layers will break down. This time around (as you can see in the photo below) I used a layer of newspaper first which I then soaked so that the weeds and grass below won't be growing into my nice beds. Then I spread a thin layer of steer manure (you can use any kind of fertilizer, really). After that cut up branches of my Christmas tree, and then another layer of manure. After that I spread out some straw and helped to fill in some of the gaps that the branches created so that the top of the soil would be more level. After that another layer of manure, and then finally a nice thick layer of compost. My favourite thing to use is Sea Soil which is very awesome and rich in nutrients. For more information on "Lasagna Gardening"